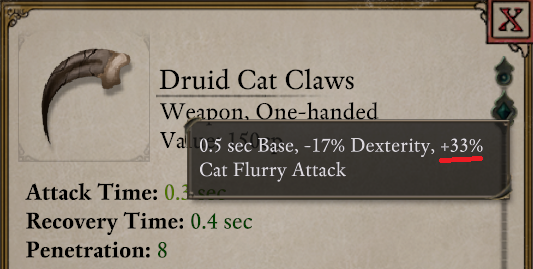 Since it's about reducing attack time and recovery time, I believe the minus sign is better suited; Cat Flurry should probably be corrected to match. Since we're talking about spiritshift, a question for QA: Do the natural weapons of spiritshift forms count as unarmed attacks? Sorry for super late reply. Currently that is the plan, the devs are currently looking at unarmed to see what changes they will be made, and implement them accordingly. Also, Ive logged in your bug with Cat Flurry as we did not have it in yet!